From time immemorial, Rattlesnake Mountain features in the Snoqualmie Tribe Story of the Moon. In the days of European settlers, this iconic peak rising just south of North Bend saw coal mining and timber harvest that began in the early 1900s. And now, Rattlesnake Mountain represents a true Northwest conservation success story and a testament to the importance of public lands. The Washington State Department of Natural Resources (DNR) recently acquired the last 24 acres within an 80 acre acquisition of land in the Rattlesnake Mountain Scenic Area, the culmination of a 25-year effort to connect thousands of acres of public lands, enable trail connections, and protect wildlife habitat. The Scenic Area is co-managed by DNR and King County as a Natural Resource Conservation Area and this property was its last remaining key wildlife and recreation connection. The Rattlesnake Mountain Scenic Area also represents one of the first conservation acquisition efforts within the Mountains to Sound Greenway. In 1993, DNR and King County purchased 1,800 acres on the northern flank of the mountain. Over the last 25 years, the Trust for Public Land (TPL) has partnered with DNR, King County, and the US Forest Service to purchase 2,150 additional acres of conservation land, working forest, and easements along Rattlesnake Mountain and the Raging River State Forest through more than a dozen separate transactions. This acquisition was funded using grant funds from the Cooperative Endangered Species Conservation Fund Program through the US Fish and Wildlife Service. 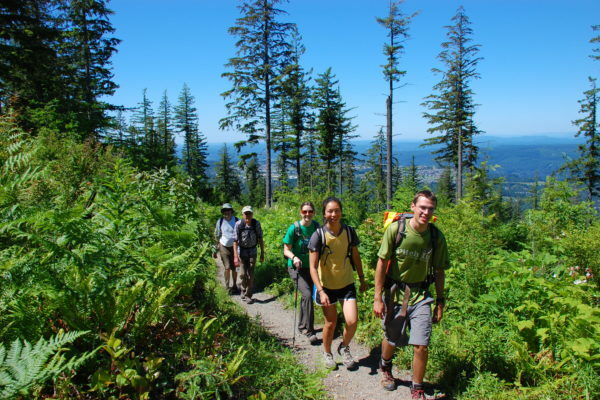 It represents a coordinated effort by both DNR and King County, as well as Forterra, TPL, and the Mountains to Sound Greenway Trust to conserve the scenic and ecological character of Rattlesnake Mountain, completing a matrix of protected lands between the Raging River State Forest, Cedar River Watershed, Rattlesnake Mountain Scenic Area, Meadowbrook Farm, and Three Forks Natural Area. Conservation success stories happen one piece at a time. It takes a broad cross-section of supporters and committed partners working together as an effective coalition to preserve this heritage for future generations. Making these connections with our communities, and engaging more people as stewards of the Greenway is the vision and path laid out in the Greenway Trust’s strategic plan to meet our region’s upcoming challenges and opportunities. Trailhead Direct is back, now with new route options that better connect you to popular hikes in the Greenway! After eight years of tireless advocacy, the Mountains to Sound Greenway has become our nation’s newest National Heritage Area. Another Win for Greenway National Heritage Designation! Continue Reading : Another Win for Greenway National Heritage Designation!